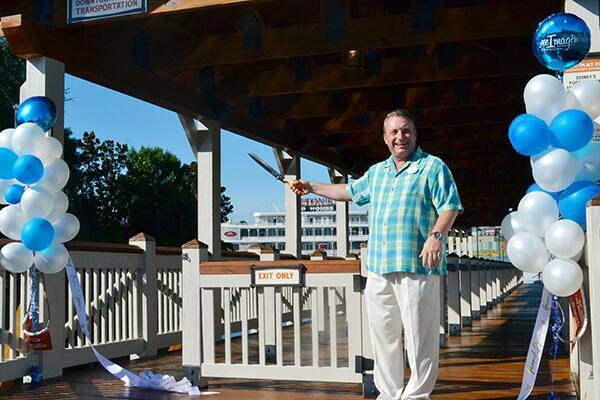 Ninety degrees, clear blue skies and the sort of fluffy white clouds you see in magazine advertisements – it was a perfect morning to officially open the new Marketplace Boat Dock and Saratoga Bridge at Downtown Disney Marketplace. Earlier today, I joined Vice President of Downtown Disney, Keith Bradford, along with cast members and guests who had gathered to celebrate the milestone- one of many that will ultimately take place as the property undergoes the largest expansion in its history, as it transforms to Disney Springs. 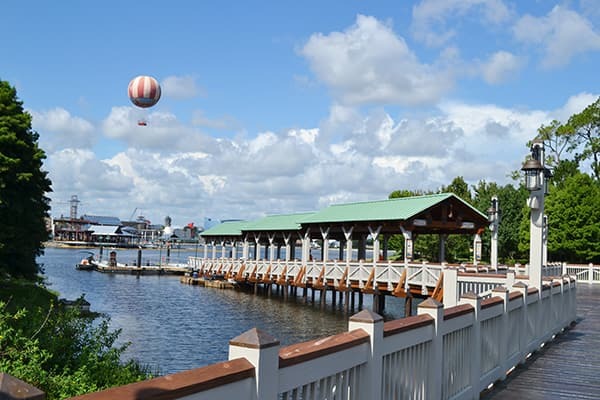 The newly-opened bridge offers a pedestrian-friendly connection between Disney’s Saratoga Springs Resort & Spa and more than 70 shopping, dining and entertainment offerings available at Downtown Disney. In addition, the Marketplace Boat Dock, now conveniently located near the Marketplace Bus Loop, provides easy access to the West Side and Pleasure Island. Guests aboard the complimentary water taxi may even learn more about what’s on the horizon (literally!) as they travel from district-to-district. One of my favorite views of Downtown Disney is from this new vantage point; with a view of the entire complex, it’s a great reminder of how much there is to see and do (which, I’ll admit, I sometimes take for granted, since I’m here every day)! Want to experience it for yourself? The Marketplace Boat Dock operates daily starting at 10:30 a.m., weather permitting. Take a ride, then let me know what you think in the comments below! I thought i was the only one who had stopped getting the blog, thinking what did I do wrong? could someone from Disney please help! I would love to get this news via email update rather than have to search online! Please bring back Mannequins Dance Palace. Hi Darcy! Looking forward to using the new bridge next month! I’m with Debbie. The Disney Parks Blog also stopped coming to my inbox. 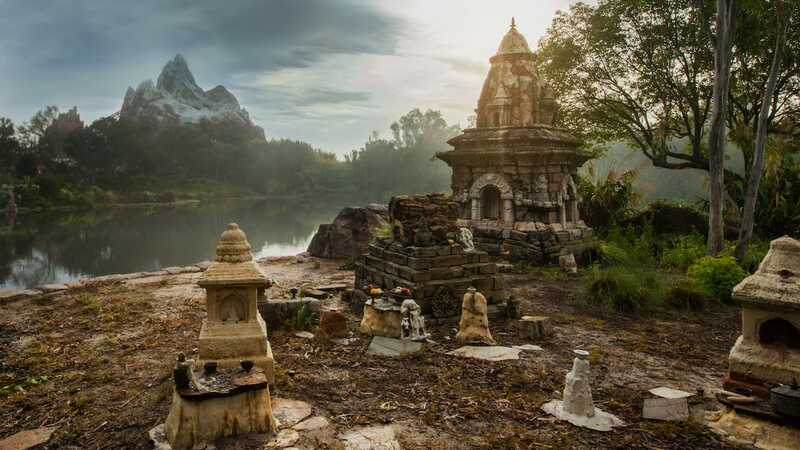 I have looked all over the Disney website and cannot find where to re-signup to get the daily emails that I so looked forward to. I have sent several emails to Disney to no avail. Can you help? So excited about this! Thanks for posting. 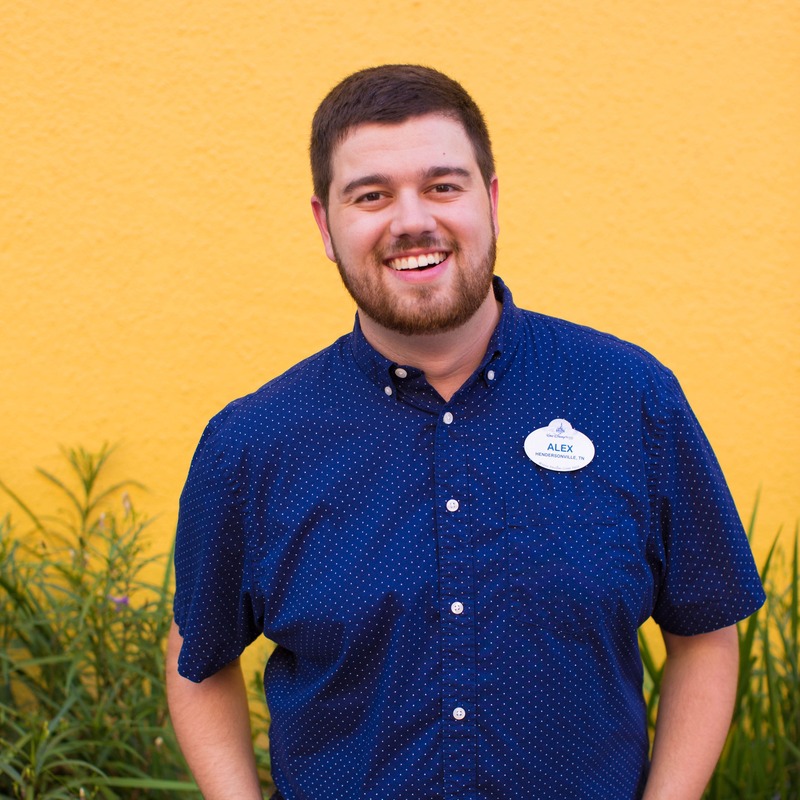 I will be staying at Disney’s Saratoga Springs in November so this is great news! Tricia, you will LOVE how close you are to everything! If you need to pop over to Marketplace Co-Op for a quick shopping trip or grab a drink at the Lava Lounge at Rainforest Cafe, it’s just a short walk away. It’s SUCH a great enhancement for guests at Disney’s Saratoga Springs Resort and Spa! It was not in service back in May when we were there – we ended up going down the further end of Downtown Disney to catch a boat, we really enjoy the ride, the scenery and the tranquility of these rides and oh yea, we end up at Port Orleans for oh I don’t know…a few beignetes…always ends up being about the food for us… :)We do look forward to Spring of 2015 when we return and we will be very happy to walk down the ramp and take in all the new sights! I haven’t received a daily email update from Disney Parks Blog since 30th June. Has the service ceased? The RSS Feed isn’t useful to me. So happy to hear about the bridge! About where does it connect? Barbara, it’s located close to the Marketplace Bus Loop, not far from Disney’s Day of Christmas and Disney Design-a-Tee.